"We'll get through this… together." Archstone Distribution has released an official trailer for a film titled Wings of Eagles, or On Wings of Eagles, formerly known as The Last Race. Produced in China, this film tells true the story of a Scottish athlete stuck in war-torn China during WWII. Joseph Fiennes plays Eric Liddell, a Scottish athlete and missionary in China. After competing in the 1924 Summer Olympics, he then returned to China and remained there until his death in a Japanese civilian internment camp in 1945. Liddell's story is also told in the famous film Chariots of Fire, though this new film focuses more on his experiences in China (he was originally born there of Scottish missionary parents). The film's cast includes Shawn Dou, Elizabeth Arends, Jesse Kove, Augusta Xu-Holland, and Simon Twu. Check this out. 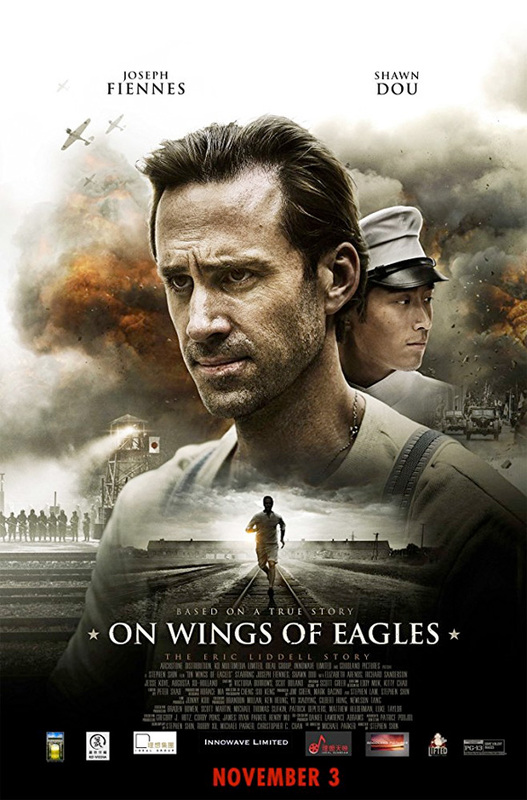 Joseph Fiennes stars in this epic drama based on the true story of gold medal runner Eric Liddell and his time as a POW during World War II. Liddell - China's first gold medalist and one of Scotland's greatest athletes - returns to war-torn China. Wings of Eagles is formerly titled The Last Race (or Zhong Ji Sheng Li) and also goes by On Wings of Eagles. Wings of Eagles is directed by filmmaker Stephen Shin (A Bite of Love, The Perfect Match, Black Cat 1 & 2, The Source of Love) & co-directed by Michael Parker (Lunch with Charles). The screenplay is by Rubby Xu & Christopher C. Chan, and Michael Parker & Stephen Shin. This was first released in China last year, in July of 2016, but hasn't played anywhere else yet. Archstone Distribution just released Wings of Eagles in select US theaters starting November 3rd this fall. Anyone?